Domestic arbitration in Singapore is governed by the Arbitration Act (Cap 10) (AA) and international arbitration is governed by the International Arbitration Act (Cap 143A) (IAA). An arbitration agreement must be in writing (Section 4(3) of the AA; Section 2A (3) of the IAA), and may be in the form of an arbitration clause in a contract or as a separate agreement (Section 4(2) of the AA; Section 2A(2) of the IAA). The writing requirement is satisfied if the content of an arbitration agreement is recorded in any form, including through electronic communication, irrespective of whether the arbitration agreement or contract has been concluded orally, by conduct or by other means (Sections 4(4) and 4(5) of the AA; Sections 2A(4) and 2A(5) of the IAA). The arbitration agreement must express a clear and unequivocal intention to arbitrate. The AA applies to any arbitration where the place of arbitration is Singapore and where Part II of the IAA does not apply to that arbitration (Section 3 of the AA). 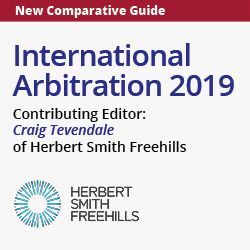 Part II of the IAA applies if the arbitration is �international' or if the parties have agreed in writing that Part II of the IAA or the UNCITRAL Model Law on International Commercial Arbitration applies (Section 5(1) of the IAA). the parties have expressly agreed that the subject matter of the arbitration agreement relates to more than one country (Section 5(2) of the IAA). The AA, which governs domestic arbitration, is based on the 1985 UNCITRAL Model Law on International Commercial Arbitration (Model Law) (without the 2006 amendments). The Court of Appeal has observed, in the context of the AA, that there was a clear legislative intent to align the AA with the Model Law (LW Infrastructure Pte Ltd v Lim Chin San Contractors Pte Ltd  1 SLR 125). As to the IAA, which governs international arbitrations, the Model Law � save for Chapter VIII � has the force of law in Singapore (Section 3 of the IAA). The AA and the IAA do not expressly identify any of their provisions as being mandatory. However, according to Section 15 of the IAA, any rules of arbitration that the parties have agreed to adopt shall be given full effect, to the extent that this is not inconsistent with a provision of the Model Law or Part II of the IAA, from which the parties cannot derogate. For example, the Singapore courts have pronounced that Article 12 of the Model Law relating to the independence or impartiality of arbitrators is mandatory (PT Central Investindo v Franciscus Wongso  4 SLR 978). The Supreme Court of Judicature (Amendment) Act 2018 came into operation on 1 November 2018 and provides for the Singapore International Commercial Court to have the same jurisdiction as the High Court to hear matters relating to the IAA such as cases where the High Court exercises its supervisory jurisdiction over international arbitrations seated in Singapore. In January 2018, the Ministry of Law circulated a consultation paper seeking views on whether the Singapore courts should award costs to the successful party on an indemnity basis in unsuccessful proceedings to set aside an arbitration award or to resist enforcement, save where the unsuccessful party can provide compelling reasons. In May 2018, the Ministry of Law sought feedback through a public consultation on whether the existing third party funding framework should be extended to new areas (See question 37 for the current third party funding framework). Yes, Singapore is a signatory to the New York Convention. Singapore acceded to the New York Convention on 21 August 1986, with the reservation that on the basis of reciprocity, it will apply the Convention only to the recognition and enforcement of foreign arbitral awards made in the territory of another Contracting State to the Convention. Singapore ratified the International Convention on the Settlement of Investment Disputes (ICSID Convention) on 14 October 1968. The Arbitration (International Investment Disputes) Act 1968 was enacted to implement the ICSID Convention. Singapore is also party to a number of bilateral and multilateral investment treaties and free trade agreements which include arbitration as a mode of dispute settlement � for example, the Association of Southeast Asian Nations Comprehensive Investment Agreement, which entered into force in March 2012. Any dispute which the parties have agreed to submit to arbitration under an arbitration agreement will be determined by arbitration, unless it is contrary to public policy (Section 11 of the IAA). Non-arbitrability is one of the grounds for setting aside an award (Section 48(1)(b)(i) of the AA; Article 34(2)(b) of the Model Law) and for refusing recognition or enforcement (Section 31(4)(a) of the IAA). The matters which are non-arbitrable are not expressly set out in either the AA or the IAA. Matters which involve public interest issues could be considered to be non-arbitrable. These include matters pertaining to citizenship, marriage, statutory licences, validity and registration of intellectual property rights, winding up of companies, bankruptcy and criminal liability. There have been various decisions by the Singapore courts on the question of arbitrability. In Larsen Oil and Gas Pte Ltd v Petroprod Ltd  3 SLR 414, it was held that disputes arising from the operation of the statutory provisions of the insolvency regime per se are non-arbitrable. In L Capital Jones Ltd v Maniach Pte Ltd  1 SLR 312, it was held that minority oppression claims are generally arbitrable, unless the particular facts raise public policy concerns. There are no restrictions on the choice of a seat of arbitration. Party autonomy is given paramount importance, and the parties are at liberty to choose any seat of arbitration. See question 1. In any arbitral or legal proceedings, if any party asserts the existence of an arbitration agreement and the same is not denied by the other party, when the assertion calls for a reply, there is deemed to be an arbitration agreement between the parties (Section 4(6) of the AA; Section 2A(6) of the IAA). The doctrine of separability is captured under Section 21 of the AA and Article 16 of the Model Law. These provisions make clear that an arbitration clause which forms a part of a contract shall be treated as an agreement independent of the other terms of the contract. Further, the invalidity of the underlying contract does not automatically invalidate the arbitration agreement contained therein. A decision by the tribunal that the contract is null and void shall not ipso jure invalidate the arbitration clause. Article 20 of the Model Law provides that the parties are free to agree on the place of arbitration. Failing such agreement, the place of arbitration will be determined by the arbitral tribunal, having regard to the circumstances of the case. The parties are also free to agree on the language of the arbitration, failing which the arbitral tribunal is likewise free to determine the language of the proceedings. A party must raise an objection to the jurisdiction of the tribunal no later than the submission of the statement of defence. A plea that the tribunal is exceeding the scope of its authority shall be raised as soon as such a matter is raised during the proceedings. However, in either of the cases mentioned above, a tribunal may admit a later plea if it considers the delay justified (Article 16(2) of the Model Law). Similar provisions may be found in Sections 21(4), (5), (6), and (7) of the AA. Yes, the arbitral tribunal can rule on its own jurisdiction, including the existence or validity of an arbitration agreement. This doctrine of competence-competence is provided for under Article 16 of the Model Law and Section 21 of the AA. A party should typically raise its jurisdictional objection before the tribunal first, before it turns to the courts of the seat. There is a possibility that a party could simply not participate in the arbitration by stating its jurisdictional objection and, after obtaining a jurisdictional ruling from the tribunal as a preliminary question, apply to the High Court to challenge the jurisdiction. A party may apply to the High Court challenging either positive or negative jurisdictional rulings by the tribunal. If the tribunal rules that it has jurisdiction as a preliminary question, or on a plea at any stage of the arbitral proceedings that it has no jurisdiction, any party may apply to the High Court within 30 days of receiving notice of the jurisdictional ruling to challenge the same (Section 21(9) of the AA; Section 10(3) of the IAA). However, a tribunal's preliminary ruling on jurisdiction can be challenged under Article 16(3) of the Model Law only if the ruling does not deal with the merits of the case (AQZ v ARA  2 SLR 972). If the ruling on jurisdiction also deals with the merits and is an award within the meaning of the IAA, recourse can then be had only to Article 34 of the Model Law and the provisions therein in relation to the setting aside of arbitral awards. In reviewing the tribunal's jurisdictional rulings, the Singapore courts apply a de novo standard of review (PT First Media TBK v Astro Nusantara International BV  1 SLR 372; Sanum Investments Ltd v Government of the Lao People's Democratic Republic  5 SLR 536). Even if a party does not apply to a court challenging the jurisdictional ruling of the tribunal pursuant to and within the timeframe stipulated under Article 16(3) of the Model Law, this does not preclude that same party from subsequently relying on the tribunal's lack of jurisdiction to resist enforcement of the final substantive arbitral award (PT First Media TBK v Astro Nusantara International BV  1 SLR 372). There are generally no restrictions on who can be a party to an arbitration agreement, so long as that party possesses the necessary legal capacity to enter into contracts. If the underlying contract, arbitration agreement or applicable rules of arbitration specify any duties in relation to the arbitration, the parties will be bound by those duties as long as they are not inconsistent with a non-derogable provision of the Model Law or the IAA. There are no specific provisions in the AA and the IAA dealing with multi-party disputes. However, the parties are free to agree upon rules of arbitration (eg, the Arbitration Rules of the Singapore International Arbitration Centre) which may contain such provisions. The Singapore courts apply a three-step approach. The courts will first give effect to the express choice of the parties; absent which the courts will look at all relevant facts and circumstances of the case to determine whether there is an implied choice as to the law of the arbitration agreement. If no implied choice can be determined, the courts will then apply the law that has the closest and most real connection to the arbitration agreement. In BCY v BCZ  SGHC 249, the Singapore High Court held that when the arbitration agreement forms a part of the main contract, in the absence of express choice by the parties on the law governing the arbitration agreement, the governing law of the main contract is a strong indicator of the governing law of the arbitration agreement. Yes, the arbitral tribunal is bound to decide the dispute in accordance with the law chosen by the parties as applicable to the substance of the dispute (Section 32(1) of the AA; Article 28 of the Model Law). Any reference to the laws of a particular state exclude its conflict of laws rules, unless otherwise expressed by the parties (Article 28(1) of the Model Law). If the parties have not decided on an applicable law, the law applicable to the substance of the dispute will be decided by the arbitral tribunal, in accordance with the conflict of laws rules that it considers applicable (Section 32(2) of the AA; Article 28(2) of the Model Law). Under the Model Law, a tribunal may decide the dispute ex aequo et bono or as amiable compositeur only upon express authorisation by the parties (Article 28(3) of the Model Law). Consolidation of proceedings is permissible when the parties agree or when the rules of arbitration chosen by the parties permit consolidation. The AA specifically permits consolidation of proceedings on such terms as have been agreed by the parties; the parties may also agree to hold concurrent hearings (Section 26(1) of the AA). Unless the parties have agreed to confer the power on the tribunal to order consolidation or to hold concurrent hearings, the tribunal has no such power (Section 26(2) of the AA). the parties to the arbitration agreement have consented to extend the agreement to a person who was not a party to the agreement, but who consents to be bound by it, with such consent forming an agreement to arbitrate (The Titan Unity  SGHCR 4). The Court of Appeal has observed that any forced joinder would impinge upon party autonomy and confidentiality (PT First Media TBK v Astro Nusantara International BV  1 SLR 372). Joinder of parties may also be permissible under the applicable rules of arbitration agreed upon by the parties. the underlying contract purports to confer a benefit on the third party. If, on a proper construction of the underlying contract, it appears that the parties did not intend the contract to be enforceable by a third party, then the arbitration agreement will not bind that third party. Under Singapore law, arbitration agreements are capable of being assigned. However, the effect of the assignment � in particular, whether the assignee is entitled to invoke the arbitration agreement, is obliged to perform the arbitration agreement or both � is a matter that has not been finally decided by the Singapore courts. Under common law, assignments are legally capable of transferring rights, but not obligations, and it is an open question whether an assignment of an arbitration agreement transfers only the right to invoke the arbitration agreement, and not the obligation to perform the arbitration agreement (Rals International Pte Ltd v Cassa di Risparmio di Parma e Piacenza SpA  5 SLR 455). Pending clarification from the Singapore courts, parties to an assignment wishing for the assignee to be bound by the arbitration agreement in the underlying contract would be well advised either to expressly provide for this in the terms of the assignment or to enter into an agreement to novate the arbitration agreement. The parties are free to agree upon a procedure for appointing the tribunal (Section 13(2) of the AA); Article 11(2) of the Model Law). If the parties have chosen to conduct their arbitration under any particular arbitration rules, the procedure under the chosen rules will be followed for the appointment of the tribunal. When the agreed mechanism for appointment fails, a party may request the appointing authority to take measures to secure the necessary appointments (Section 13(5) of the AA; Article 11(4) of the Model Law). in an arbitration with three arbitrators, each party shall appoint one arbitrator and the two arbitrators shall appoint the third. For these purposes, the President of the Court of Arbitration of the Singapore International Arbitration Centre has been designated as the appointing authority (Section 13(8) of the AA; Section 8(2) of the IAA). If the number of arbitrators is not determined by the parties, there shall be a single arbitrator (Section 12 of the AA; Section 9 of the IAA). Parties are generally free to agree on any qualifications required of arbitrators. No person shall be precluded by reason of nationality from acting as an arbitrator, unless otherwise agreed by the parties (Section 13(1) of the AA; Article 11(1) of the Model Law). An arbitrator may be challenged only if justifiable doubts exist as to his or her independence or impartiality, or if he or she does not possess the qualifications agreed to by the parties. A party may challenge an arbitrator it has appointed only for reasons of which it becomes aware after the appointment has been made (Section 14(3) of the AA; Article 12 of the Model Law). In respect of an arbitrator's independence or impartiality, the test to be applied is an objective one: whether there are any circumstances that would give rise to a reasonable suspicion or apprehension in a fair-minded reasonable person with knowledge of the relevant facts that the tribunal was biased. The parties are free to agree on a procedure for challenging an arbitrator (Section 15(1) of the AA; Article 13 of the Model Law). If there is no such agreement, any party which intends to challenge an arbitrator may send a written statement to the tribunal specifying the reasons for the challenge within 15 days of the constitution of the tribunal or after becoming aware of the circumstances for challenge. If the challenged arbitrator does not withdraw or the other party does not agree to the challenge, the arbitral tribunal shall decide on the challenge. If the challenge is rejected, the challenging party may apply to the Singapore courts within 30 days of receiving the notice of the decision rejecting the challenge to ask the Singapore courts to decide on the challenge (Section 15(4) of the AA; Article 13(3) of the Model Law). An arbitrator is replaced in accordance with the rules applicable to the appointment of the arbitrator being replaced (Article 15 of the Model Law). Under the AA, the parties are free to agree on how the vacancy is to be filled (Section 18 of the AA). Failing any such agreement, the procedure for appointment of arbitrators under Section 13 of the AA shall apply (see question 24). Both the AA and the IAA impose a duty on an arbitrator to disclose the existence of any circumstances that may give rise to justifiable doubts as to his or her impartiality or independence � this duty is a continuing one and persists throughout the course of the arbitration (Sections 14(1) and (2) of the AA; Article 12(1) of the Model Law). The tribunal is obliged to act fairly and impartially, treat parties with equality and give each party a reasonable opportunity to present its case (Section 22 of the AA; Article 18 of the Model Law). The tribunal is not permitted to delegate its task of deciding on the issues in dispute to others. The tribunal is also obliged to give reasons for its decision (Section 38(2) of the AA; Article 31(2) of the Model Law). While there is an increasing recognition in international jurisprudence that a tribunal is under a duty to render an enforceable award, this is not expressly provided for in the AA or the IAA; nor have the Singapore courts had the opportunity to address this. any mistake of law, fact or procedure made in the course of arbitral proceedings or in the making of an arbitral award (Section 20 of the AA; Section 25 of the IAA). The parties are free to agree upon the procedure to be followed in the conduct of arbitral proceedings (Section 23 of the AA; Article 19 of the Model Law). If there is no such agreement, the arbitral tribunal may conduct the arbitration in a manner it considers appropriate. This power includes the power to determine the admissibility, relevance, materiality and weight of any evidence (Section 23 of the AA; Article 19 of the Model Law). An arbitral tribunal has powers to give orders and issue directions for security for costs, discovery of documents and interrogatories, giving of evidence by affidavit and power to administer oaths (Section 28 of the AA; Section 12 of the IAA). Unless otherwise agreed by the parties, the tribunal also has power to appoint experts (Section 27 of the AA; Article 26 of the Model Law). Specifically, in respect of international arbitrations, the tribunal may request court assistance in taking evidence (Article 27 of the Model Law). Article 17 of the Model Law and Section 12 of the IAA provide that an arbitral tribunal has power to grant various types of interim reliefs, including interim injunctions, security for costs, and orders for the preservation and interim custody of any property or evidence. On the other hand, whilst Section 28 of the AA likewise provides an arbitral tribunal the power to grant interim reliefs, there are certain powers that are available to arbitral tribunals under Section 12 of the IAA that are not available to arbitral tribunals under Section 28 of the AA. These include, the power to secure the amount in dispute, to grant freezing injunctions, and to grant interim injunctions � these are reserved for the Court under Section 31 of the AA. In general, a tribunal may make adverse costs orders against parties that do not comply with its orders. An aggrieved party may also apply to the Singapore courts for leave to enforce the arbitral tribunal's orders as if they were orders made by the court; if leave is given, judgment may be entered into terms of the order (Section 28(4) of the AA; Section 12(6) of the IAA). the delay has given rise or is likely to give rise to a substantial risk that a fair resolution of the issues in that claim is not possible, or has caused or is likely to cause serious prejudice to the respondent (Section 29(3) of the AA). any party fails to appear at a hearing or to produce documentary evidence, the tribunal may continue the proceedings and make the award on the evidence before it. Unless otherwise agreed by the parties, a tribunal may make more than one award at different points in time on different aspects of the matter, and may make an award relating to an issue affecting the whole claim or a part of the claim or counter-claim (Section 33 of the AA; Section 19A of the IAA). Award means a decision of the arbitral tribunal on the substance of the dispute and the definition of an �award' includes interim, interlocutory or partial awards, but excludes any orders or directions made under Section 12 of the IAA or Section 28 of the AA, as the case may be (Section 2 of the AA; Section 2 of the IAA). In respect of such orders or directions, see question 29(c). An arbitral tribunal may grant any remedy or relief that the High Court in Singapore could have ordered if the dispute had been the subject of civil proceedings in that court (Section 34 of the AA; Section 12(5) of the IAA). The tribunal may award interest on a simple or compound basis, from such date and at such rate as the tribunal considers appropriate, on the whole or any part of any sum awarded by the tribunal or any sum which is in issue in the proceedings, or costs awarded in the proceedings. Unless the award otherwise directs, the sum awarded shall carry interest from the date of the award and at the same rate as a judgment debt (being simple interest at a rate of 5.33% per annum) (Section 35 of the AA; Section 20 of the IAA). An arbitrator shall not be liable for negligence in respect of any acts or omissions in the capacity of an arbitrator, and any mistake in law, fact or procedure made in the course of arbitral proceedings or in the making of an arbitral award (Section 20 of the AA; Section 25 of the IAA). Yes. A party to an arbitration agreement, or any person claiming through or under such party, may make an application to the Singapore courts to stay the proceedings in respect of any matter which is the subject matter of the arbitration agreement between the parties. Such an application may be made at any time after appearance and before delivering any pleading or taking any other step in the proceedings (Sections 6(1) and 6(5) of the AA; Sections 6(1) and 6(5) of the IAA). Under the IAA, the court to which an application is made shall make an order staying the proceedings insofar as they relate to the subject matter of the arbitration agreement, unless the court is satisfied that the arbitration agreement is null and void, inoperative or incapable of being performed (Section 6(2) of the IAA). the applicant was, at the time when the proceedings were commenced, and still remains, ready and willing to do all things necessary for the proper conduct of the arbitration (Section 6 of the AA). hear applications to set aside or to enforce arbitral awards, as the case may be (see questions 38 to 43). order interim relief in aid of international arbitrations to which Part II of the IAA applies, irrespective of whether the place of arbitration is in the territory of Singapore (Section 12A(1)(b) of the IAA). Neither the AA nor the IAA has provisions expressly permitting the parties to exclude the powers of the court by agreement. The tribunal has wide discretion to award costs, unless otherwise agreed between the parties. The general practice in this regard has been that �costs follow the event' (ie, costs are paid by the losing party). There is generally no limit on the quantum of costs that may be awarded. However, if the overall successful party has not succeeded on all issues raised, this may be taken into account to reduce the costs awarded to reflect the relative measure of success. Section 21 of the IAA provides that costs in an international arbitration may be taxed by the Registrar of the Singapore International Arbitration Centre; while Section 39 of the AA provides that costs in a domestic arbitration may be taxed by the Registrar of the Supreme Court of Singapore. For domestic arbitrations, it is presumed that the principles applicable to taxation of costs in Singapore court proceedings will be applied. However, for international arbitrations, neither the IAA nor the arbitration rules of the Singapore International Arbitration Centre provide any guidance as to the principles to be applied. For an arbitration governed by the AA, any provision in the arbitration agreement to the effect that the parties or any party shall, in any event, pay its own costs of the reference or award or any part thereof shall be void (Section 39(2) of the AA). However, such a provision will not be void if it is part of an agreement to submit to arbitration a dispute which arose before such agreement was made (Section 39(3) of the AA). There is no equivalent provision for international arbitrations under the IAA. It has a paid-up share capital of not less than S$5 million or not less than S$5 million in managed assets. Amendments to the Legal Profession Act and Legal Profession (Professional Conduct) Rules clarify that legal practitioners may introduce or refer funders to their client and can advise their clients in relation to the third-party funding contract (as long as they receive no direct financial benefit from the referral); but also that legal practitioners are under a duty to disclose to the court or tribunal, as the case may be, the existence of third-party funding and the identity of the third-party funder. The award must be in writing and be signed by the sole arbitrator or by a majority of the arbitrators (provided that the reason for any omitted signature is stated). The award must state the reasons upon which it is based, unless the parties have agreed otherwise or the award is made by consent of the parties. The award must mention the date of the award and the place of arbitration; the award is deemed to have been made at the place of the arbitration. After the award has been made, a signed copy of the award must be delivered to each party (Section 38 of the AA; Article 31 of the Model Law). There is no time limit prescribed for rendering an award. Specifically, under Section 36 of the AA, the court has power to extend the time for making an award for such period and on such terms as it thinks fit when the time is limited by the arbitration agreement. There is no equivalent power under the IAA. In this regard, the Singapore courts have held that an undue delay in the making of an award in and of itself does not suggest that the arbitrator or tribunal is partial or lacks independence, and is also not a basis on which the award may be set aside (PT Central Investindo v Franciscus Wongso  4 SLR 978). An award (regardless of whether it is made in a domestic arbitration or in an international arbitration seated within or outside of Singapore) may be enforced by leave of the High Court, in the same manner as a judgment or an order to that effect. When leave to enforce is granted, a judgment may be entered in terms of the award (Section 46 of the AA; Sections 19 and 29 of the IAA). where the award or agreement is in a foreign language, a translation in the English language, duly certified in English as a correct translation by a sworn translator or by an official or by a diplomatic or consular agent of the country in which the award was made (Section 30 of the IAA; Article 35 of the Model Law; Order 69A Rule 6 of the Rules of Court). A party to the arbitration agreement was under some incapacity; or the said agreement was not valid under the law to which the parties have subjected it or, failing any indication thereon, under the law of Singapore. The party making the application was not given proper notice of the appointment of an arbitrator or of the arbitral proceedings, or was otherwise unable to present its case. The award deals with a dispute not contemplated by or not falling within the terms of the submission to arbitration, or contains decisions on matters beyond the scope of the submission to arbitration, provided that if the decisions on matters submitted to arbitration can be separated from those not so submitted, only that part of the award which contains decisions on matters not submitted to arbitration may be set aside. The composition of the arbitral tribunal or the arbitral procedure was not in accordance with the agreement of the parties, unless such agreement is in conflict with a non-derogable provision of the Model Law, the AA or the IAA or, failing such agreement, was not in accordance with the Model Law, the AA or the IAA (as the case may be). The subject matter of the dispute is not capable of settlement by arbitration under the law of Singapore. The award conflicts with the public policy of Singapore. Specifically, under Section 49 of the AA, a party may appeal an award on a question of law arising out of the award. A question or law does not mean an error of law; a question of law is rather a point of law in controversy which must be resolved after opposing views and arguments have been considered. If the point of law is settled and not something novel, and it is contended that the arbitrator made an error in the application of the law, there lies no appeal against that error, for there is no question of law which calls for an opinion of the court (Prestige Marine Services Pte Ltd v Marubeni International Petroleum (S) Pte Ltd  1 SLR 917). There is no equivalent provision in the IAA. An application to set aside an award (whether made in a domestic or international arbitration) must be made within three months of the date on which the party making the application had received the award, or if a request has been made for the correction or interpretation of an award or for the arbitral tribunal to make an additional award, three months from the date on which the request is disposed of by the arbitral tribunal (Section 48(2) of the AA; Article 34(3) of the Model Law). An application to appeal an award made in a domestic arbitration on a point of law under Section 49 of the AA must be made within 28 days of the date of the award Section 50(3), AA. Yes, this is permitted, provided that the parties' intention to do so is clear and unequivocal. The AA and the IAA do not explicitly impose a duty of confidentiality. However, a party may apply to have hearings otherwise than in open court and for other measures to preserve the confidentiality of the proceedings in relation to arbitration (Sections 56 and 57 of the AA; Sections 22 and 23 of the IAA). An implied obligation of confidentiality in arbitrations has been recognised by the Singapore courts (AAY v AAZ  1 SLR 1093; Myanma Yaung Chi Oo Co Ltd v Win Win Nu  2 SLR(R) 547). The public interest or the interests of justice require disclosure.